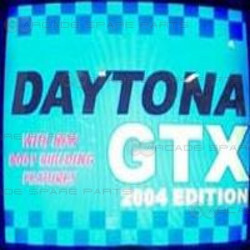 The Daytona GTX 2004 Upgrade Kit (for Daytona USA) gives players more options and control over the game than the previous versions of Daytona. Players accrue points when playing Daytona GTX through this new Upgrade Kit, and then may redeem these points in return for enhancements made to their car. At the end of their game, players are given a PIN number, which they enter when they return to play the game again. This PIN number allows the machine to recognise how many points the player had won during their last round. Players can then choose to either continue playing and adding to the points they have already accrued, or they have the option to modify their car. Modifications available include the option to turbo charge the car, add armour, change the tyres and / or engine capacity. PLEASE NOTE: you need one upgrade per seat. Please note that this kit may only be compatible with the original 1994 version of the game and not the Saturn version.